Few situations reveal someone’s true nature more effectively than a long-term relationship, with its many struggles, arguments and triumphs. In light of that, I’d argue that the best way to identify a ‘good man’ is to look at the way he treats his partner at various points in their relationship. Today, let’s take a look at 7 romance-related characteristics all good men possess. A good man never resorts to violence for any reason other than self-defense. Even when arguments get heated, he’d sooner walk away than even threaten physical violence. Why? Because he knows domestic abuse is never justified. Even in situations like cheating or lying where a lesser man might see no other option but to retaliate, a good man has the self-control and respect to handle things in a civilized manner. A good man is able to support his partner emotionally – even when he doesn’t fully understand their goals. As long as those goals will lead his partner to happiness and fulfillment, he’ll have no problem playing cheerleader. On the flip side, if a good man notices his partner reaching for a goal that’s more likely to result in catastrophe, he will encourage and support their switch towards healthier options. Although social expectations and roles in relationships have changed plenty over the past several decades, providing protection and security is still a fundamental part of being the man in a relationship. A good man recognizes this and is always ready to stand up for his partner and look out for her safety, whether the threat is being made to feel uncomfortable or being taken advantage of. A good man will never cheat. No matter how much other women tempt him, he just won’t do it. Similarly, he won’t lie or steal from his partner – or anyone, for that matter. The unfortunate truth is that a good man has probably had those things done to him at some point or another (see the ‘nice guys finish last’ phenomenon).He knows how much it bites, so he’s not going to subject anyone else to that misery. Now, some men appear selfless because they lack confidence and feel the need to ‘bribe’ women with gifts and favors. A good man is able to maintain that selflessness even if he’s totally confident in his ability to keep a partner. If there’s extra money floating around in the relationship at the end of the month, he doesn’t head out the door with it for a weekend on the town with the boys before asking his partner if she had any plans for it. This point is the culmination of all those that came before. With all these awesome characteristics, a good man makes his partner feel special. He knows the world is filled with abusive, unsupportive and dishonest people – many of whom his partner probably comes into contact with on a daily basis. His goal in the relationship is to show his partner that they are valuable and that good people do exist. 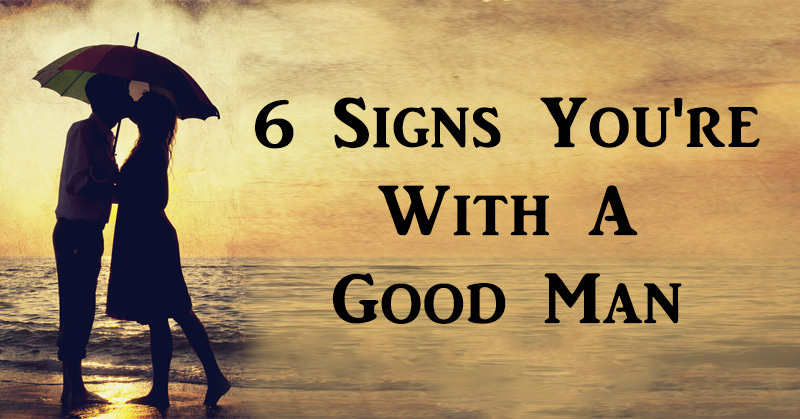 Check out this video for more information on what makes a good man!